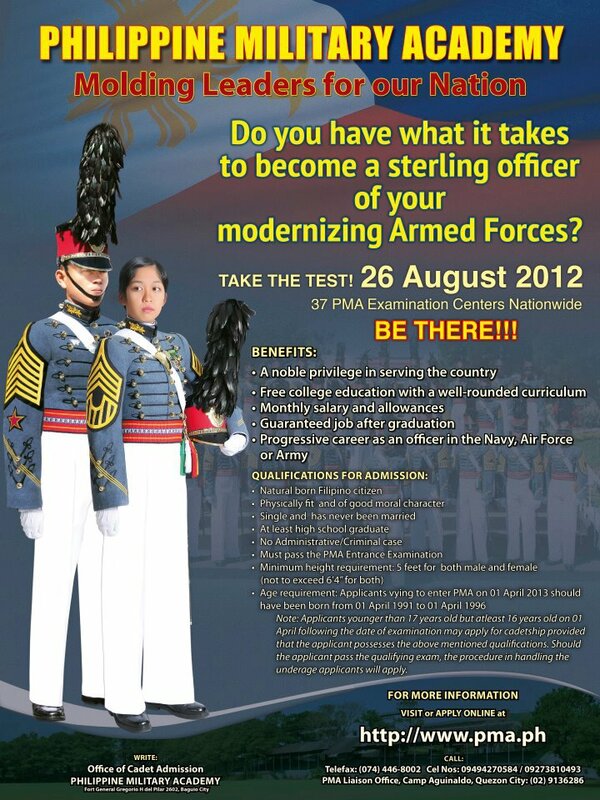 Take the Philippine Military Academy (PMA) Entrance Exam set this Aug. 26! Attention young and brave men and women of South Cotabato! Here's your chance to join the military and study in the premier military school in the country- take the Philippine Military Academy ( PMA) Entrance Exam! The PMA Office of the Cadet Admission will conduct this year's PMA Entrance Examination on August 26, 2012, a Sunday in 37 PMA Examination Centers nationwide. In SOCCSKSARGEN, it will be held at Koronadal National Comprehensive High School in Koronadal City, Mindanao Polytechnic College in General Santos City and Notre Dame of Cotabato in Cotabato City. The PMA Entrance Exam is open to all Filipino citizens aged 17 to 22 years old by April 1, 2013 who are single (never been married); at least 5’0’’ tall both for male and female and not exceeding 6’4”; at least a high school graduate; of good moral character; no pending administrative or criminal case; and physically and mentally fit for active military service. Those who are interested and qualified are advised to submit a fully accomplished application form which can be downloaded from the academy's official website - www.pma.ph along with a copy of an authenticated birth certificate and certified true copy of High School Form 137 to the Office of Cadet Admission of PMA two weeks prior to the exam date. The PMA entrance examination this year will cover Algebra and Geometry, Grammar and Composition, Reading and Comprehension, Verbal and Numerical Reasoning and Pattern Analysis. Successful candidates shall be provided a well-rounded and free college education, receive stipend while studying, have a progressive career as an officer of the Philippine Army, Philippine Navy or Philippine Air Force. For those who have inquiries call the Office of Cadet Admission in the following numbers: (074) 446-8002, (074) 447-3690 loc. 6751/6752, 09273810493 or 09494270584.